INTRODUCTION: Approved in June 2016 by the U.S. Food and Drug Administration (FDA), the hydrogel corneal implant Raindrop®, designed for the correction of presbyopia, modifies the central zone of the anterior surface of the cornea, creating a hyper-prolate region with higher power focus for near and for intermediate distance. Up to date there are no studies in the literature with follow-up over 1 year after insertion of the implant. OBJECTIVE: To evaluate the long-term safety and efficacy of hydrogel corneal implant Raindrop® for the treatment of presbyopia. 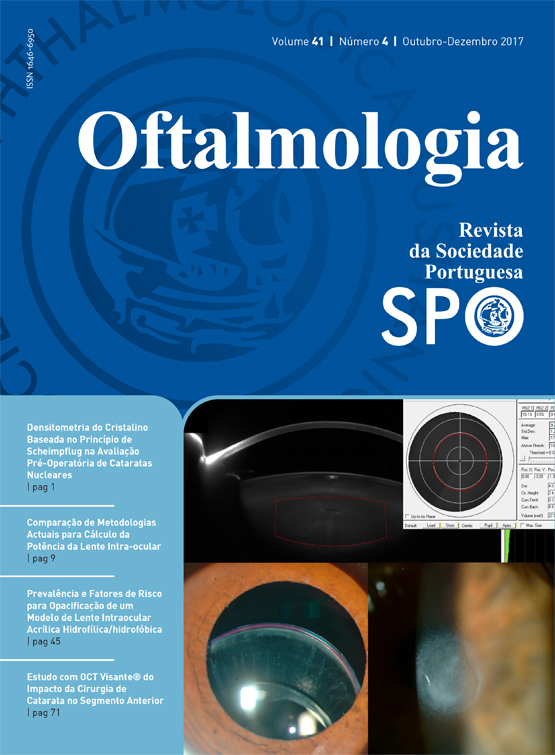 METHODS: Retrospective study of cases of presbyopic eyes undergoing insertion of a hydrogel corneal implant (Raindrop®) in the non-dominant eye. Clinical information was collected, including visual acuity, follow-up time, surgery interventions, biomicroscopy and corneal topography. RESULTS: Six eyes of 6 patients previously submitted to hydrogel intracorneal implant (Raindrop®) were included. Three implants were explanted due to low visual acuity, secondary to the presence of corneal haze, associated with the implant. In one case there was melting of the cornea above the implant, followed by itsexposure, despite the long time since its implantation (5 years). The presence of corneal haze occurred in 6 patients, ranging from moderate to severe. The minimum follow-up period was 2 years and the maximum was 5 years. CONCLUSIONS: This is the first study in patients with the hydrogel corneal implant Raindrop® with minimum follow-up of 2 years. Our results show that this implant, approved by FDA this year, has a poor long-term safety profile due to the presence of corneal haze and melting, with the consequent need to explant a large number of devices. Hydrogel corneal implant; Raindrop®; presbyopia.